Perú – país precioso | A balanced diet . . . I can’t remember why I had always wanted to visit Peru. All I know is that since I was a small boy, Peru had held a big fascination for me. I used to spend time leafing through an atlas, and spending most time looking at the maps of South America, especially Peru. And I promised myself (in the way that you do when you’re small, and can’t see how it would ever happen) that one day I would visit Peru. Just a few months after I had begun my graduate studies at the University of Birmingham in October 1973, my head of department, Professor Jack Hawkes, returned from a 2-month trip to Bolivia to collect wild potatoes, and had spent time in Lima with Dr Richard Sawyer who became the first Director General of the International Potato Center (CIP) in October 1971. He was looking for someone to work at CIP for one year from September 1971 to look after a large collection of native Peruvian potato varieties while a young Peruvian took his MSc degree at Birmingham. To cut a long story short, I didn’t go in 1971, but landed in Lima at the beginning of January 1973 after a long and gruelling flight on B.O.A.C. from London via Antigua (in the Caribbean), Caracas, and Bogotá. Until I was able to rent an apartment, I stayed in the Pensión Beech (a boarding house) in San Isidro for about three weeks. Arriving at night, I was driven through the darkness to the pensión and hadn’t a clue where I was or where I was going. The following morning I woke to a bright summer’s day, and was amazed at the beauty of Lima gardens, particularly the stunning bougainvilleas that seemed to be growing everywhere, as well as bright red poinsettia shrubs (small trees actually), a plant I had only ever seen growing as a pot plant! Eventually, I found a one bedroom apartment in the center of Miraflores, next to the Todos supermarket (I wonder if it’s still there? ), and then, once my wife had joined me in July 1973 (we were married in the Municipalidad de Miraflores in October 1973) we rented a 12th floor apartment on Av. Larco near the corner with Av. Benavides (there was an ice cream parlor on the ground floor – 20 Sabores). But the 12th floor is not ideal place to be when an earthquake struck, as they did with increasing regularity after the massive quake of October 1974 (measured at 8.1 on the Richter scale at La Molina where I was working, and lasting for more than 2 minutes). Peru is a country of amazing contrasts. Just click here to view a web album of photos I took during 1973. First there is the geography: the long coastal desert stretching north from Lima to the border with Ecuador, and south to Chile where it merges with the Atacama Desert. It hardly ever rains on the coast, but the sea mists that are prevalent during the months of July-September do provide sufficient moisture in some parts (lomas) to develop quite a rich flora. The Andes mountains take your breath away with their magnificence. The foothills begin just a few kilometers from the coast, and the mountains rise to their highest point in Huascarán (6,768 m), the fourth highest mountain in the western hemisphere. And to the east of the Andes is the selva, the vast plain of tropical rainforest, dissected by huge rivers, flowing north towards the River Amazon, and, thousands of kilometers later, eastwards to the Atlantic Ocean. Second, Peru is a country of cultural diversity and a rich archaeology. Everyone has heard of the Lost City of the Incas, Machu Picchu, ‘discovered’ by Yale professor Hiram Bingham in 1911. But throughout the country there are many sites that demonstrate the long cultural development of different groups, especially along the coast oases where rivers flowing westwards from the Andes brought life-giving water to the coastal desert. And there is also considerable evidence for the range of plants and animals that these peoples domesticated: the potato, beans, cotton, peanut, and llamas to name but a few. Fortunately this rich history has been preserved and Lima boasts some of the best museums in the world. From north to south, different peoples wear different dress. In Cajamarca, the typical dress is a tall straw hat and a russet-colored poncho. In central Peru, the women wear hats like the one shown in the photo on the right. The south of Peru, around Cuzco and Puno is more traditional still. Peru is also a country of great handicrafts – from the leather goods made in Lima, to the carved gourds or mate burilado, clay figures of farmers or religious effigies, to a wealth of brightly colored textiles. Lastly on this short celebration of Peru, I have to mention some of my favorite food – and I’ve learned that in recent years Lima has become one of the top gourmet capitals of the world. If I had to mention just a couple of dishes they would be ceviche (fish marinated in lime juice and hot chili peppers, and served with sweet potato) and papa a la huancaina, made from sliced yellow potatoes, and boiled eggs, and covered with a spicy sauce. And one of the great ways of serving food is the pachamanca. Of course, all washed down with a good Peruvian beer – Cusqueña, Arequipeña, or Pilsen Callao (my favorite). 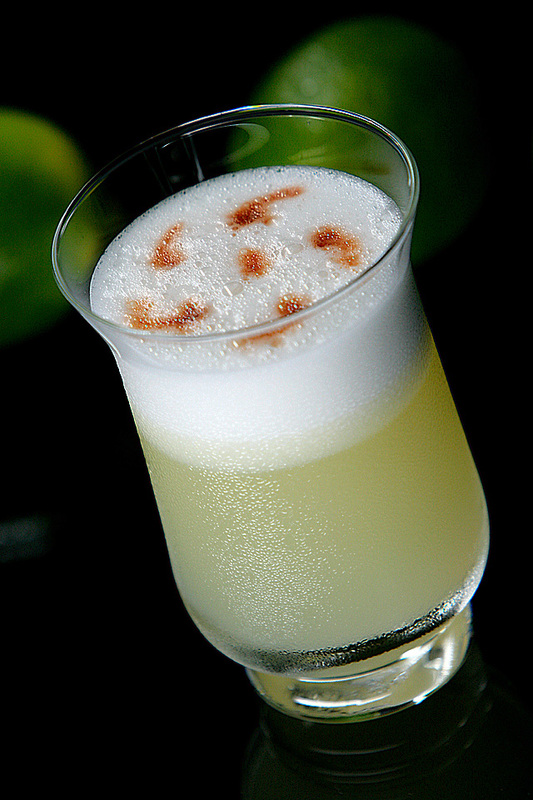 But I have to mention my favorite drink: pisco sour. Whoever invented that deserves a medal! The only drink better than a pisco sour is a second one. I was privileged to live in Peru for three years, and have visited there many times since. My work took me all over the country to collect native varieties of potatoes, and to carry out field studies on how farmers adopt and use different varieties. I never lost the excitement of arriving in Lima and waiting to get out into the wild country. Lima is an enormous city now. It’s been more than a decade since I was last there. In 1973 it seemed there was hardly enough water for a population of about 1.5 million if my memory serves me well. The latest data indicate that Lima now has a population in excess of 9.3 million. I’m told the traffic situation is horrendous. Certainly the road network around the country has improved – much of my time was spent on dirt roads, hugging the sides of mountains, with precipices up to 1000 m. Not the sort of place to take your eyes off the road. Given the opportunity I would go back to Peru tomorrow. Although I have seen a good deal of the country, there’s still more to see. I traveled by road, by air, on foot, and on horseback. I slept in schools and a post office, and been eaten up by fleas in a hotel in northern Peru. But I enjoyed (almost) every minute – the friendliness and friendship of Peruvians, and the wonderful paisajes (landscapes), and its illustrious history. This entry was posted in Musings from the past, Out and about, Travel and tagged Andes, indigenous civilizations, Peru, potato, South America, travel.